If Edge J-trims were purchased for finishing off your ceiling edges, you can attach the trim to the ceiling panels or to the ceiling along the perimeter, before installing the ceiling panels. If applying the trim to perimeter of ceiling first, the trim can be bonded to the ceiling using Loctite PL Premium adhesive by applying a 1/8″ bead to the back of the trim and pressing firmly on to the ceiling. Nails or staples can be used to tack trim in place until adhesive is cured. NOTE: If you purchased Crown Molding to finish your edges, you can learn how to install crown molding here. Clean surfaces. Before starting, make sure all surfaces are clean, dry, flat, smooth, and free from dust, grease, etc. Lightly sand any glossy surfaces to remove sheen. Understand the overlap feature. Prior to installation, it is important to understand the overlap feature of each panel. Each panel has two 1/2″ flat lips for overlapping. Arrange all panels this way so additional panels can be added to the top or right side of any panel. Determine the room layout. Map your ceiling on graph paper before beginning installation. Locate and draw any light fixtures, heating vents, intersecting hallways, closets and doorways. Occasionally these features can influence starting points, tile placement and finished ceiling design. To ensure professional looking results, the room layout should be balanced with panels centered in the room and equal size border panels used on opposite sides of the room. To find out what size to cut the border panels in one direction, see the formula below. Then repeat formula for other direction. Establish your string (or chalkline) at this measurement (see above). These lines should be parallel with the walls and will help you align the first border panels. If your room is out of square, adjust accordingly. For 2′ x 4′ ceiling panels. To find out what size to cut the border panels in the 24″ panel width direction, see the formula above. Then, repeat formula for the 48″ length direction (if using a 2×4 panel), but use 48″ instead of 24″ in the formula. The deep indentations in the Traditional 3 & 5, Art Deco, and Rosette styles prevent them from being cut in the middle and resting properly at the border areas as a border panel. Accordingly, these styles look best when the Hammered style panels are used on the perimeter of the room. All other styles can be cut and used as a border fill panel. Measure and cut border panels. Measure and cut the border panel to the previously determined size. After cutting the panel and before applying glue, clean the back surface of the panel by wiping with a clean cloth and rubbing alcohol. Refer to manufacturer’s directions. Use rubbing alcohol in a wellventilated area away from ignition sources. The preferred method for installing Glue-Up panels is to apply the adhesive directly to the back of the ceiling panels using Loctite® PL Premium tube adhesive in a 1/8″ diameter bead. Or use tub adhesive. In both cases, we recommend spreading the material out on the panel evenly with an 1/8″ trowel shown below. Keep adhesive about 1/2″ from the outside edges to prevent leakage. Carefully read and follow manufacturer’s directions for the adhesive. Edge Trim. If applying to perimeter of room, install now. Installing first panel. If you chose to apply Edge J-trim to panel before installing, insert panel into to trim. Place this first panel at the corner farthest from the main entrance of the room. Overlap. Overlap subsequent border panels by laying your next panel on top of the previous panel’s 1/2″ Flat Lip overlap connection. 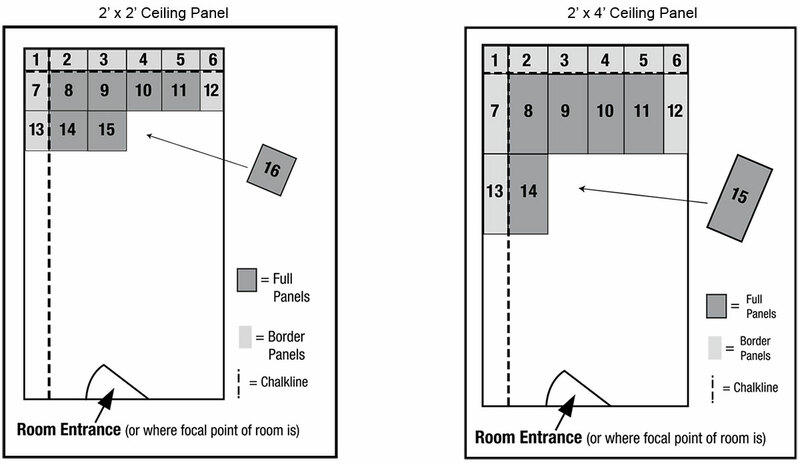 Working in rows across the room, add panels in order according to diagram below.Install the full panels by overlapping each new row over the previous row. Complete each row by cutting and installing the remaining border panels if applicable. You must remove any adhesive that gets on the finished side of the panel before it dries. Using a cloth or paper towel, clean off any residue with mineral spirits. One hour after the ceiling has been completed, firmly press on ALL the ceiling panels you’ve installed to ensure proper bonding and adhesive set-up.